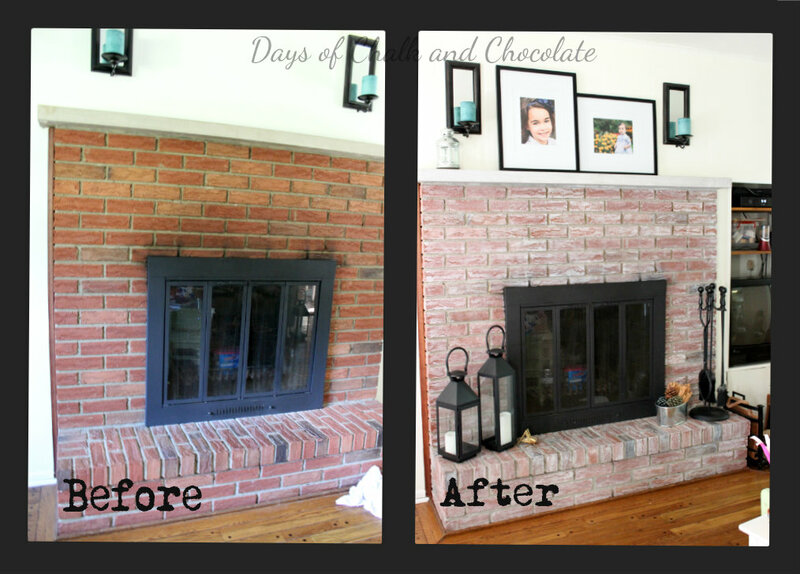 One of my most favorite projects to date is my whitewashed brick fireplace. Before: OMG. Unedited photo and clearly uncropped. It’s like leaving the lady’s room with my dress tucked into my tights. But there you go. After: Unedited but not nearly so embarrassing. OK, the clock leaning against the fireplace is a bit embarrassing but I really don’t know where to hang the darn thing. Oh and you want to see more of my September mantel? Well, I just happen to have a link around here somewhere. Hmm, let me, oh yes…HERE. Let’s keep this short, shall we? How are bullet points? As always when I’m painting, I kept a full container of baby wipes nearby to clean up any drops right away. I used much less of the water/paint mixture than I anticipated and ended up with more than half left. I tried to convince Jim to let me do the brick in the front of my house but he started hyperventilating while shouting, “No! No! No! No!” HA HA HA! This is so pretty, Jenny! When I first bought my house it had a red brick backsplash in the kitchen…UGH….I white washed it and haven’t looked back. I dream of replacing it but for now, the whitewash is working quite fine.